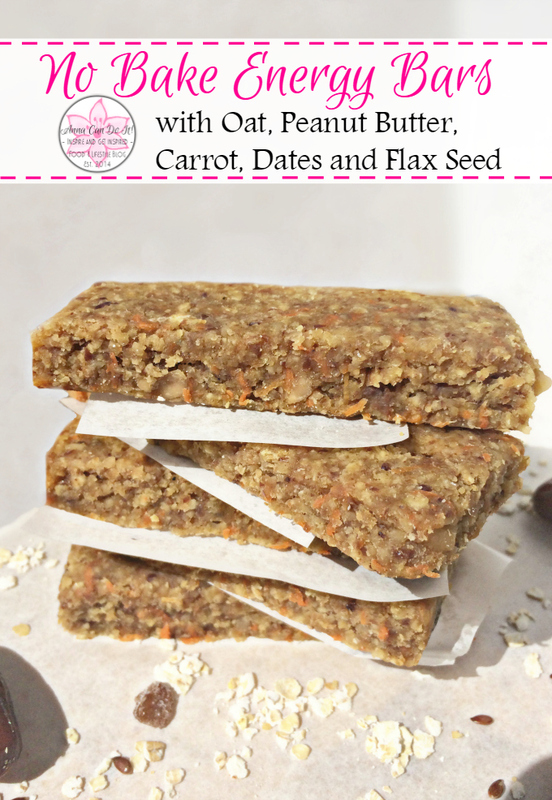 No Bake Energy Bars with Oat, Peanut Butter, Carrot, Dates and Flax Seed. 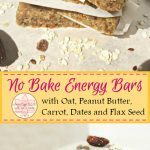 These pocket-size no bake energy bars are so delicious, filling, unbelievably easy to make and only a few ingredients needed. Perfect for snack, workout food, and even for breakfast! It’s a remake of my Energy Bars, but now it has better texture, more delicious and with a strong food processor, you can process and combine the ingredients all at once, which means way less mess! I love to make my own chewy, healthy, divine energy bars, it’s a much better choice than buy one in the store! I know exactly what I put in them, I know there is no preservative, no additional food coloring, nor sugar! Perfect grab-and-go for the busy days – which happen often these days -, you can make them ahead and store them in the fridge! Since it’s easy to reach (store in fridge, packet size), there is no more excuse to have a quick breakfast, and there is no need for junky snacks! Pour hot water on the chopped dates. Add the coconut oil, the lemon zest and the honey to the dates, mix them well. Grind the flax seed with a spice grinder. Put the flax seed flour, the peanut butter and the grated carrot (plus the optional raisins) to the food processor. Add the oat and the dates with the water to the food processor too. Let them combine completely, it'll take a minute or two. Pour the mixture to the pan, level it, so the energy bars will be even thickness everywhere. Put it in the fridge for at least minutes before serving it! So, why would you buy energy bars, when you can make 20 in 15 minutes? Anyway, it was a lifesaver for me last week, we had a really busy week, so I hardly had any time to sit down and eat a normal breakfast. It was super delicious, I just grabbed one from the fridge or my bag and I was ready to go, and since it was so filling, I wasn’t hungry ’til lunch! For customization I recommend a pinch of cinnamon, some chocolate chip, chopped nuts (if you’re not allergic to them), chopped cranberries or a drizzle of chocolate on the top. Really worth to try it, so simple and delicious! Kids will love it too! 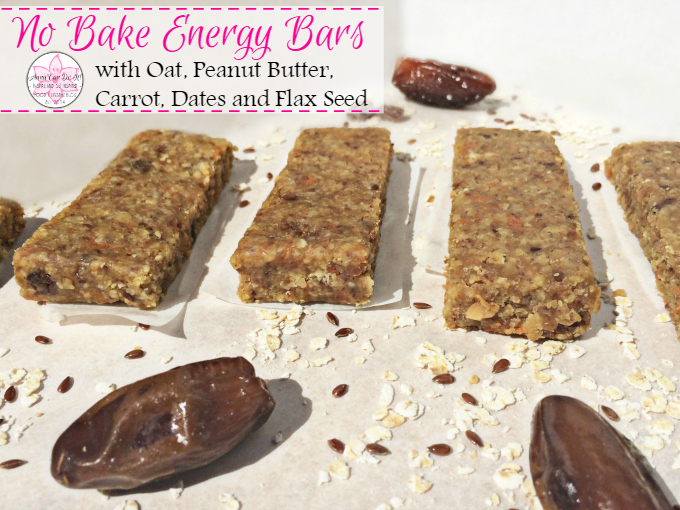 Do you make your own energy bars? Or Do you prefer to buy them instead? And why? Do you have a favorite energy bar? What is your favorite flavor/flavor combination? Yum!! Pinning and making soon. These looks amazing! Love an easy no-bake, homemade granola bars. Woah! These look super good! I love how the only sweeteners are honey and dates! Definitely going to give these a try! Thanks for sharing! Mine came out super crumbly and won’t stay together. How can I fix this? Add or subtract something?